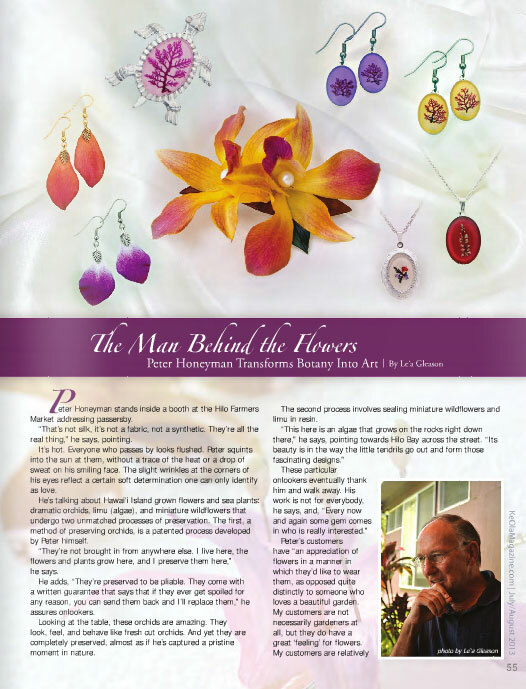 Couldn’t be happier with the “Ke Ola Magazine” article spread on Real Flower Jewelry in the 2013 July Issue. Thanks to the Ke Ola Magazine team for doing such a wonderful job! A special thanks to editor Renee and reporter Le’a for such an amazing article! Peter Honeyman stands inside a booth at the Hilo Farmers Market addressing passersby. “That’s not silk, it’s not a fabric, not a synthetic. They’re all the real thing,” he says, pointing. It’s hot. Everyone who passes by looks flushed. Peter squints into the sun at them, without a trace of the heat or a drop of sweat on his smiling face. The slight wrinkles at the corners of his eyes reflect a certain soft determination one can only identify as love. He’s talking about Hawai‘i Island grown flowers and sea plants: dramatic orchids, limu (algae), and miniature wildflowers that undergo two unmatched processes of preservation. The first, a method of preserving orchids, is a patented process developed by Peter himself. “They’re not brought in from anywhere else. I live here, the flowers and plants grow here, and I preserve them here,” he says. He adds, “They’re preserved to be pliable. They come with a written guarantee that says that if they ever get spoiled for any reason, you can send them back and I’ll replace them,” he assures onlookers. Looking at the table, these orchids are amazing. They look, feel, and behave like fresh cut orchids. And yet they are completely preserved, almost as if he’s captured a pristine moment in nature. The second process involves sealing miniature wildflowers and limu in resin. Peter’s customers have “an appreciation of flowers in a manner in which they’d like to wear them, as opposed quite distinctly to someone who loves a beautiful garden. My customers are not necessarily gardeners at all, but they do have a great ‘feeling’ for flowers. My customers are relatively intellectual and thinking people, more mature, and mostly women,” he explains. He also adds that 90 percent of his sales are bought as gifts. Another couple passes by. “Have you seen these before?” chirps Peter. The couple shakes their heads. “Well then you haven’t lived!” he chuckles. Peter’s business, Wearable Real Flowers of Hawaii, is somewhat the product of many years of figuring out what he didn’t want to do in life. Peter spent his formative years in Rhodesia (now Zimbabwe), where he inherited a love of botany. “My mother would never throw away a live flower. Her favorites were grasses. She was fascinated by them, saying, ‘Why doesn’t everybody see what I see in grass?’ As a little boy I was schooled with grass. The flora [in central Africa] is just wonderful,” says Peter. As a young man he went on to acquire degrees in law and economics, and a Master’s Degree in business. He worked for a time with the police, then as a public prosecutor (district attorney), later an assistant magistrate, and went on to join a large South African based international corporation where he worked his way ultimately to Chief Executive. “Back here, totally on my own, doing what I’m doing, have been the seven happiest years of my life. When you’re in a business atmosphere, they’re all doing what is most important for them. I realized that what I was doing was proving to myself I could do things that were not naturally what I wanted to be doing,” says Peter. He has been working with flowers since 1989, doing so-called “slow work” in exchange for the “fast work” of his past. Even so, his success with his preservation techniques has taken him all over the world where he sells out at most flower shows and TV shopping networks. “I do not just turn a machine on and produce all night. There’s a season when the flowers are growing, and I’m watching them and emotionally urging them to look the way I want. For instance, when I go underwater looking for limu, I don’t just go out and grab something. Something makes me want to ponder them, and there’s something there that calls out, ‘This one is going to appreciate what I’m doing’,” says Peter. Perhaps most notable about Peter’s work is his unique patented preservation process. Prior to developing the method, he ran a business on O‘ahu that sold exclusively to gift shops at airports all over North America. “I would never fail to be impressed by the huge number of flowers at airports. I thought, ‘You can’t get out of Honolulu in less than a four or five hour flight, and what do those flowers look like at the other end?’ Sometime later, I was in San Francisco and I came out of an airport business meeting right as a flight from Honolulu was disembarking. These women came out looking exhausted and the flowers looked worse,” Peter says. He began to brainstorm a business opportunity, looking for a way to preserve the flowers so they could be enjoyed long-term. “It took me forever to get it right. I thought you could go to the floral industry and buy a bottle of something. They all laughed at me, and when I told them what I was trying to do they said I was looking for the Holy Grail. I thought they were trying to keep me out, but after about six months of research I didn’t see any of them doing what I wanted. I came to the conclusion that they did not know how to do it,” says Peter. While researching how he might preserve flowers, Peter discovered it is common in Europe to see pressed flowers under glass. However, this allows a minute space for air which can oxidize the flowers, thereby discoloring them. “I researched and was not happy with the risk. I didn’t invent this, I read up on the technology. I place my dehydrated flowers into whatever setting I’m using and pour hot resin over them. With one technique up-and-running, Peter continued to experiment. Through a lengthy process of trial and error, he eventually developed an unprecedented method of preserving orchids and roses so they remained pliable, retain their colors, and were strong enough to be practical to wear. “There’s a certain amount of satisfaction at having solved what hundreds of people have not. I’ve got this need to feel that what I’m doing is unique,” Peter adds. As for his pressed flowers, Peter has chosen flowers that the average person might pass on a daily basis. “I’ve chosen them because the average person going down any nice country walk or down the side of the road would see them. I’m astonished how tourists notice them and the locals don’t,” says Peter. Later, standing on the lānai of his Ainako home, he points to the lawn. “In this patch of grass there’s one particular little flower used in my designs. I go out there on my hands and knees picking these tiny things. To anybody else I’m being a nutcase out on my lawn—I’m not, I’m actually working,” he laughs. He also smiles as he talks about gathering limu. “The other day I collected my latest batch at Richardson’s Beach. I was putting the stuff into containers and labeling them. Somebody came up and asked, ‘What on earth are you doing?’ And I said, ‘I’m working.’ He didn’t believe me. It then dawned on me that I’d been having fun working at my daily job,” he says. And while some might think Peter is reaching retirement, he attests to feeling 21 years old. “The technical aspects of it give me some satisfaction in that I’ve achieved something that nobody else has done. When I see the facial expressions of someone opening a gift of my product that someone’s given to them and puts it on, I know I’m bringing to them a wonderful feeling,” he smiles. Recently, a teen passed by his booth and picked up a flower that he turned and put on his mother’s lapel. “I don’t think she studied the flower. What she knew was that she was wearing what he thought was beautiful, which in turn made her beautiful. I think of how I am exciting and satisfying emotions. When I see that pleasure, I know I’ve something worthwhile,” he says. As Peter sits on his lovely shaded porch, looking out at the mountain stream that bubbles through the gardens, it seems that maybe he doesn’t even realize how he’s touched others. “My oldest daughter was talking to my younger daughter, and she said, ‘Look at him, he hasn’t been happier in years. He’s working with the Divine’,” he remembers. Peter Honeyman’s Wearable Real Flowers of Hawaii can be found Wednesdays and Saturdays at the Hilo Farmers Market, at the monthly Kailua Village Stroll, and on his website.